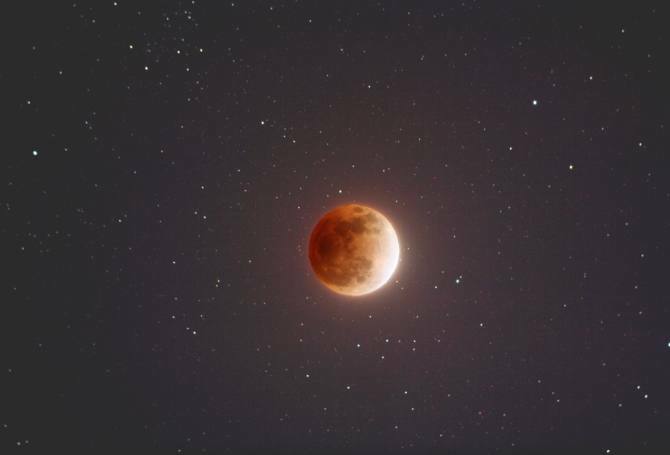 Super Blue Blood Moon Happens On Jan 31, This Is How You Can Experience It! Here's your chance to see a super blue blood moon for yourself, so mark your calendars and set your alarms! Skywatching parents out there, grab the kids for this cool celestial event. We’re in for a rare treat on January 31: a blue moon, a total lunar eclipse and a supermoon all in the same month! Some have decided to call this event a super blue blood moon. The last time this happened was 35 years ago. You might be wondering, what happens during a super blue blood moon? A blue moon is when two full moons happen in the same calendar month. A lunar eclipse, on the other hand, happens when the moon passes into the Earth’s shadow, turning it into a rusty red colour. A supermoon occurs when the moon’s closest approach to Earth in a single orbit coincides with a full moon. In the case of the super blue blood moon, the supermoon happens during the day of the lunar eclipse. “The next full ‘supermoon’ will appear only 7% bigger and a bit brighter than an average full Moon,” said Italian astrophysicist, Gianluca Masi in a statement. January’s first full moon happened on the night of January 1 or the morning of Jan. 2, depending on where you were in the world at the time. On the other hand, the second full moon and the lunar eclipse will take place on the night of Jan. 31, or the morning of Feb. 1 if you’re in the western hemisphere. The supermoon, meanwhile, will take place on the night of Jan. 30. It’s technically a day before the moon reaches its peak fullness but NASA is willing to still call it a supermoon. Due to time differences around the globe, not everyone will see the blue moon this month. This is because January’s second full moon won’t appear in some places until February 1. In places like Melbourne, Australia, the second blue moon won’t appear until 1:26 a.m., so technically, they’ll only be seeing a super blood moon. The difference between lunar eclipses and solar eclipses makes the lunar ones more accessible compared to solar ones. Solar eclipses are only visible in specific places on earth during the day while lunar eclipses are visible from anywhere it is night time. As one travels west across the Pacific, the lunar eclipse will occur earlier in the night. Moonwatchers in Tokyo will see the super blue blood moon on January 31. The Earth’s shadow will touch the moon at 8:48 pm, reaching maximum eclipse at 10:29 pm. The lunar eclipse will end at 1:08 am for watchers in Tokyo. In New Delhi, moonrise will happen at 5:55 pm local time. The moon will be fully covered by the Earth’s shadow at 6:21 pm and will turn red after reaching half a hand’s width above the eastern horizon. Moonwatchers in eastern Europe and western Asia will experience a mirror image of the lunar eclipse that observers in the western hemisphere will see. Instead of happening near moonset, the eclipse will start before moonrise. Dr. Debiprosad Duari, Director, M. P. Birla Planetarium, Kolkata, told The Hindu that the super blue blood moon can be seen in India on the evening of January 31st. “In India, the eclipse will start around 17:18 IST. It will be total at 18:21 hours and remain totally eclipsed till 19:37,” he said. Post this, the total eclipse shall end and you will notice the Moon coming out of Earth’s shadow. “The partial eclipse ending around 20:41 hrs. The totality of the eclipse will last for about 1 hour and 16 minutes,” he told the daily. Barring any cloudy weather, you’ll see a large full moon near the horizon, shining a rusty red. If you’d like to watch this event with your kids, you can go up the top of a building way above the level of the streetlights. Better yet, you can take a drive to a place with less light pollution. Far from the city lights, you will experience a darker night sky and brighter stars. 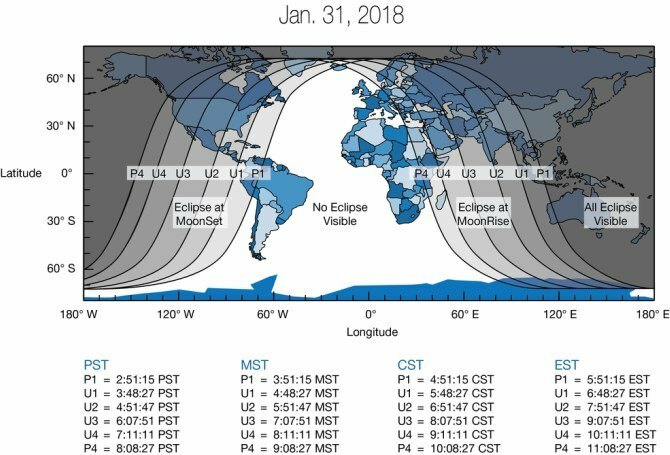 If you won’t be able to see the super blue blood moon, you can watch a livestream of it at TimeandDate. YOU CAN ALSO READ: Solar eclipse and pregnancy: Do you believe in these myths? Just in: Indian mother gives birth to quintuplets within 30 minutes! Horrific! Mumbai dad strangles 45-day-old baby girl to death! Shocking! Baby girl found thrown on a roadside in Bhopal covered with ants!